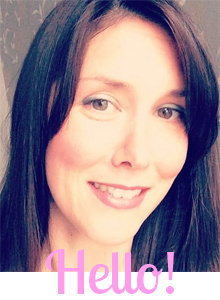 I ♥ Motherhood: Farmhouse Breakfast Week - How did we fare? 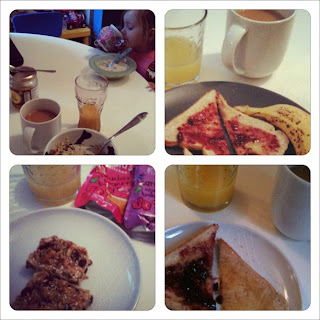 Farmhouse Breakfast Week - How did we fare? And here's a little montage (using my new Frametastic App!) of days 3 (Muesli), 4 (Toast with Blackcurrant Conserve & Banana), 5 (Breakfast Energy Bars) & 7 (Toast with Blackcurrant & Blueberry Preserve). Day 6, there was a breakfast but I forgot to take the pic! Saturday mornings are always so manic as I'm on my own with the kids and we have to be out of the house by 9.15 to go to MAD Academy. Well I would say that I agree with the notion that breakfast benefits your mood. With my baby boy getting me up around 5am most days of late I would say my mood is definitely a bit off key until breakfast time! I am happier after breakfast and I think a healthy breakfast sets a person up for the day. I have found that far from being rabbit food, muesli is actually quite filling! As I'm off work on maternity leave I would say that my breakfast habits are generally quite good at the moment as I have two kids to give breakfast to and so it would be weird for me to not sit down with them and eat while I'm feeding them/ they are eating. What I have learnt is that it is nice to vary what we have for breakfast, we don't have to have the same things every day and also this week was the first time Isla had honey. I told her what it was on the first day and where it came from and the second day she was really sweet and asked 'Mummy, can I have some bees please?' I knew exactly what she meant! It's nice for the kids to learn things over breakfast! She also liked the idea of having banana cut up on a plate and taking as much as she wanted for her porridge. Anything we can do to encourage her to further improve her eating habits is good in my book. Will I keep it up? My breakfast habits tend to go haywire when I'm at work, so I would like to think that I would keep up the good habit of having a healthy breakfast everyday. Sometimes I'd have it but really late when it's almost lunchtime, other times I would skip it altogether. Heat the butter & honey in a saucepan until the butter has melted. Stir in the remaining ingredients except sesame seeds and press into a 22cm square baking tin. Sprinkle over the sesame seeds. Bake for 15 mins until golden. Allow to cool slightly before cutting into 12 bars. Leave in the tin to cool completely before removing. Honey & Yoghurt Porridge with Banana - A must on a winters day! Place the oats in a saucepan. Mash half the banana and mix with the yoghurt (keep 1 tbsp aside), milk and 1 tsp honey then pour over the oats. Heat to just below boiling and simmer gently for 7 - 8 mins, stirring. Pour into a bowl, slice the remaining banana and scatter on top, add the 1 tbsp Greek yoghurt and drizzle over the remaining honey. We were sent a hamper of breakfast items to help us on the way to a week of healthy breakfasts. Thank you for asking us to take up the challenge, we thoroughly enjoyed it! Farmhouse Breakfast Week - Shake Up your Wake Up! The Year that was 2011!